You’ve got the enthusiasm. You’ve got the dream. The budget? 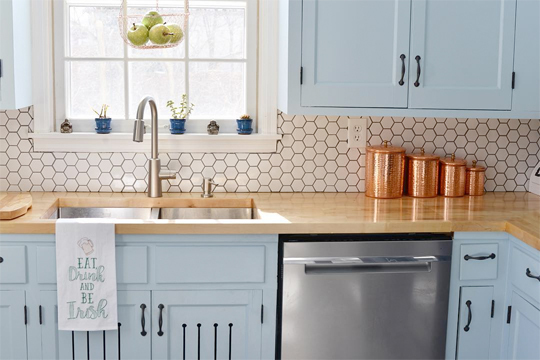 Weeeell … Budget-conscious homeowners sometimes put off a home renovation they really, really want because it feels like a treat, rather than an investment. So get that Adirondack out of the dirt. Treating yourself to a patio or deck is an investment you can love and profit from. A span of luscious hardwood is some seriously rewarding eye candy: It lasts for decades and typically returns 91% of your investment. Keep the layout simple (no intricate borders or inlaid patterns) to save $1 to $2 per square foot. Handle prep work, like removing and disposing of the old flooring and removing furniture, to cut labor costs. Big money for big joy: That’s one way to describe a full kitchen reno. And if you need an excuse, er, reason, to get cooking on a renovation, consider this: You could recoup $40,000, so you’re basically getting a $65,000 kitchen for a mere $15,000 — plus years of enjoyment. To keep from busting your budget (most homeowners do), spend at least six months deciding what you really want so you’re less likely to create costly changes along the way. Work added on after the contract is signed bumps up homeowners’ budgets by an average of 10%. For a room that occupies so little of the house, the bath packs a lot of pricey items. Countertops, cabinetry, flooring, tubs, and plumbing fixtures add up. Consider tile flooring that looks like wood but performs like porcelain. Splashed water and humid air will warp real wood. Limit the amount of tiny tile you use. All that grout requires serious upkeep to keep clean. Opt for white tubs and sinks that will never go out of style. Just think about all those 1950s aqua toilets you’re glad you don’t have. Right. White would have been a better choice. Talk about curb appeal that pays you back. A typical landscaping project with bushes, mulch, a stone walkway, flowering shrubs and a tree or two has great impact on your home’s curb appeal — just another way of saying “cha-ching” when you sell. Because you almost always get your full investment back on landscaping projects. In fact, you usually get a bit more. Talk about the possibilities: a home theater, playroom, office, or even a rentable apartment. And, much like the kitchen and bath, you’ll get a good bit back — typically a little more than 60%. Is a bathroom a necessity? Does that bar actually need to be wet? Adding basement plumbing will significantly boost your budget because of the whole making-water-defy-gravity thing. Would finished concrete floors with rugs suffice, rather than getting into the costs of vapor barriers, subflooring, and carpet padding? Plain old concrete sure makes for easy clean-up in a rec room or play space. Do you need separate rooms? Create one open space and you’ll save on doors, studs, and drywall. Plus, nothing feels like a better add to your home than a new, giant, woo-wee, look-at-all-this-space room. It’s kind of a big deal. You rely on a good, healthy roof to keep costly threats — namely water, insects, mold, and wildlife — out of the house and keep conditioned air inside. While it may not be a “dream” investment, the ROI for a roof is pretty dreamy, often more than 100%. Some homeowners opt to shingle over an existing roof rather than springing for a new one, but that’s a waste of money. You won’t be able to see (much less repair) damage to the actual roof unless you take the shingles off.